Columbia-TriStar, widescreen 2.35:1/16x9, languages: English DD 5.1 [CC] & Digital Stereo, Cantonese DD 5.1 & Digital Stereo, subtitles: English, French, single side-dual layer, 28 chapters, rated R, 113 min., $24.95, street date 4/18/2000. Directed by Benny Chan. Starring Stephen Fung, Chan Ho, Grace Ip, Sam Lee, Toru Nakamura, Francis Ng, Eric Tsang, Nicholas Tse, Lam Ka Tung, Daniel Wu, Terence Yin. Direct from the action film capital of the world comes Gen-X Cops, rocket-fueled drama at its most arresting! Hong Kong police crack an underground ring of smugglers, seizing a massive shipment of explosives. But when the arms are recovered by Japan's public enemy number one, Akatura, the countdown begins to a sale of the deadly contraband that will place the world in the hands of international mercenaries! But when a rebellious trio of Gen-X Cops infiltrate the underworld, they discover that Akatura has a much more sinister plan for the volatile cargo than fueling worldwide warfare. Now the criminal instincts that nearly barred them from the force are the most powerful weapons that Gen-X Cops have to save the city from the devastating act of terrorism! There's an old joke that goes "I went to a fight last night and a hockey game broke out." That statement pretty well encompasses my thoughts about Hong Kong martial arts films; they seem to focus so strongly on whiz-bang action scenes that the meat of the matter - the story - usually appears to be an afterthought. My viewing of Gen-X Cops didn't alter my opinion in the least. The story seems like standard stuff for this kind of film. We find the usual Hong Kong thugs up to their usual nastiness and the usual cops infiltrate the gang and are put into the usual situations (inevitable, their loyalty is tested in some fashion) with the usual outcomes that lead to the usual slam-bang climax and the usual conclusion in which right overcomes evil. Even the modest twist added to Gen-X Cops is fairly stale, since all it does is rip-off The Mod Squad. You see, the cops in question aren't ordinary old police - nope, they're rebellious young 'uns who're going to do things their own way! The only difference between our three leads and the Mod Squad is that Gen-X Cops' crew are all male and Asian (though a female also appears in this film, she isn't really an equal partner). Gen-X Cops isn't without its thrills. As is usually the case in these movies, the action scenes are well-executed and the stunts are spectacular. The lack of real story simply took away from the experience for me. I'm not a stickler for perfect plotting, but I'd at least like to see some sort of coherent attempt at a narrative, and that of Gen-X Cops seems lacking. The film could have succeeded better if I'd found any of the actors interesting or even if some dialogue had been witty or clever. That latter issue is a tough one; since everything has to be translated, any possible panache will likely disappear. The actors seem competent but unspectacular and largely lacking in charisma. 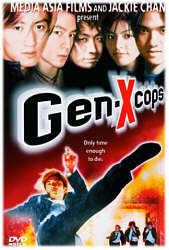 Ultimately, Gen-X Cops may appeal to serious fans of the genre but I doubt it'll do much for others. Gen-X Cops appears in its original theatrical aspect ratio of approximately 2.35:1 on this single-sided, dual-layered DVD; the image has been enhanced for 16X9 televisions. While generally pretty good, the picture presents enough problems to only put it into "B" territory. Sharpness usually seems pretty crisp and accurate, but a lot of scenes seem flat and soft. This issue largely clears up as the film continues; I noticed more hazy segments during the first half of the movie than during the second, but they can be found throughout the film, nonetheless. Moiré effects and jagged edges are largely absent, but I did see some artifacts related to the anamorphic downconversion on my 4X3 TV; buildings created the most problems in that regard. The print itself was fairly clean, though I noticed occasional mild grain and some light speckling at times. Colors were largely decent but sometimes the looked oversaturated and too dense; as with most of the picture's issues, these occurrences were fairly rare, but they existed nonetheless. Black levels appeared quite good, with some rich and deep tones, and shadow detail was similarly fine. All in all, Gen-X Cops looks good, but not terrific. The same can be said for the film's Dolby Digital 5.1 soundtrack. Actually, Gen-X Cops contains two separate 5.1 tracks; one is in the original Cantonese and the other is an English dub. If you've read my other reviews of non-English productions, you'll know that I generally prefer dubs because I feel subtitles detract from the visual aspects of the films. However, it depends on the quality of the dub; if the English is well-integrated into the mix, they work well, but if not, they become more distracting than the text. The English dub for Gen-X Cops falls into that latter category. I flipped back and forth between English and Cantonese but couldn't stand to watch much of the former; the English dialogue did not blend with the actions and the sound well and the vocal performers all had that ridiculously American sound that seems to characterize dubs of Asian films; after all the jabs these tracks have taken over the years, you'd think they would have improved the quality by now, but I guess not. As such, I preferred the original Cantonese soundtrack. It helped that much of the movie is actually in English anyway; the dialogue mixes Cantonese and English throughout the film. Whichever version you choose, the quality of the music and effects seemed identical; the only differences appear to stem from the speech. Gen-X Cops presents a good but inconsistent sound field. The pseudo-techno music works the best, as it spreads nicely to all five channels and really adds some heft to the mix. Effects are more problematic. At times, we get some very involving action, with bullets that fly all around us and ambience that engulfs us. On other occasions, however, you'll be left to scratch your head and wonder if the sound engineers were napping during some scenes; whereas some of the many explosions rock us with great heft, many stick almost completely to the center channel and seem pathetically small. Overall, I thought the soundfield worked pretty well, but plenty of those unusually meek moments occur. Quality also appeared erratic. Dialogue was the worst offender. I can't comment on the intelligibility of the Cantonese, of course, but the English (from the original track, not from the dub) was acceptably clear. Unfortunately, much of the dialogue appeared slightly distorted and edgy; it doesn't alter your understanding of what is said - especially since you're likely to have to read most of the speech - but the harshness created an unnecessary distraction. Effects seemed clearer and lacked such signs of distortion, but they also suffered from inconsistency. Some effects (explosions, gunfire) were bold and taut and packed a solid punch, but others appeared relatively wimpy and lacked depth. For the most part, the effects were fairly rich, but you never quite knew which you'd get. The music scores the only complete victory here, as it consistently sounds great; the score is clear and crisp and features some excellent bass. As with the picture, the soundtrack of Gen-X Cops is generally very good, but its lack of consistency knocked my rating of it down a few pegs. If one takes a gander at the package of the Gen-X Cops, one might not think it offered much in the way of supplements. I saw it had deleted scenes and a documentary but not much else, and I figured that in total, these pieces would probably only amount to maybe 10 minutes of screen time; I thought we'd have maybe three minutes of deleted scenes, and a cheesy seven-minute featurette and I'd go on with my life. Happily, I was quite wrong about these issues. First of all, the documentary actually runs for about 33 minutes. Clearly created for Asian audiences - as demonstrated by the shot of the three stars yelling, "Don't buy pirated videos!" at the very end - this program's something of a mess in that virtually no attempt was made to give us a coherent picture of the film's creation. Instead, we witness a barrage of film clips and behind the scenes shots intercut with interviews from cast and crew; all of those comments are in Cantonese except for the statements from American Daniel Wu, which are in English. Despite the unusual pacing, the documentary remains pretty interesting and fun, mainly due to the presence of the behind the scenes footage. We get to see a lot of good clips of stunts and effects, all of which added to my amazement, since it's clear they still don't use quite as many "safety nets" in Hong Kong as they do in Hollywood. The interviews contribute a few pieces of good information to the picture, and it's a worthwhile documentary. One serious negative: the annoying faux-punk tune "You Can't Stop Me" - performed (at least sung) by the film's three leads - appears almost constantly throughout the program. If I never hear that piece of junk again, it'll be too soon. After the documentary ends, there's an odd montage of film clips. I don't know if this is the "teaser trailer" listed on the case, but it's bizarre. Basically, it shows you the whole movie - in more-or-less chronological order - chopped down to five minutes. I don't know what the point of it was, but it's there for your perusal. Unfortunately, no chapter marks are used for the documentary, so if you want to access this segment, you have to fast forward all the way to about the 33-minute mark to get it. The deleted scenes section runs for a whopping 51 and a half minutes. Most of these segments are actually extended versions of existing scenes, so it's not like all 51 plus minutes are new, but it's still an awful lot of material. I can't say I found much of it interesting - I didn't care for the finished product, so why would I like the outtakes? - but I still am happy to see this stuff here; it's sure to be a lot of fun for the film's fans. Two trailers can also be found on this DVD. We get a pretty good one for Gen-X Cops itself; this clip seems aimed at a foreign audience, since it uses no dialogue (everyone knows we Americans can't stand them furriners!). The other preview is for Jackie Chan's Who Am I, which was an English production. Finally, the DVD wraps up with the usual terrible Columbia-Tristar "Talent Files". Actually, in this case it's a talent file, since only a listing for executive producer Jackie Chan. That's even worse than usual. CTS produce some great DVDs - why can't they write some decent biographies? Gen-X Cops offers some occasionally compelling thrills and stunts, but it lacks a real plot and mainly seems to be a random conglomeration of action sequences. The DVD provides pretty good sound and picture and tosses in some surprisingly solid supplements. Fans of the Hong Kong action genre may enjoy Gen-X Cops, and they're sure to love this DVD. Anyone else may find that it warrants at most a rental.